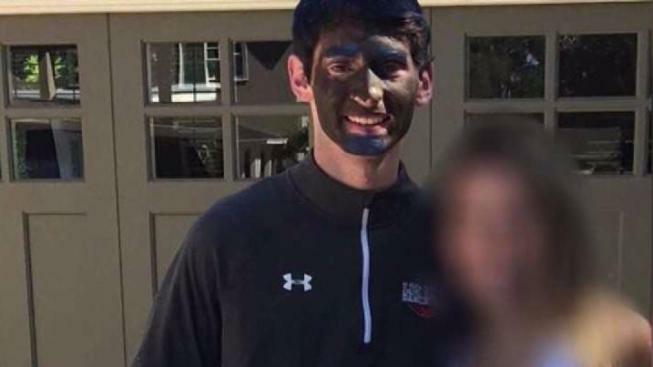 A student at Los Gatos High School wore blackface depicting an emoji on social media to ask for a date to the prom, and now the school is stepping in to address what some deem as racist behavior. The incident stems from two separate posts on social media, and on Monday, the student at the center of one of the posts says it was taken out of context. "My intentions were to just ask a girl to prom, not to be racist," the unidentified student said Monday. The student said it all started when he asked a girl to the prom with his bitmoji on Snapchat. When that didn't work, he showed up at her house dressed as the bitmoji, including putting on black face, he said. "To dress up like my bitmoji, I had no racist intentions. I didn't mock the African-American community at any point," the student said. The prom proposal isn't sitting well with school parents. "I was shocked; I was horrified," said Pilar Crawford. "But then it also shows me that he doesn't think that's wrong, he doesn't understand, or maybe he does, how black people feel about black face." It wasn't the only incident of concern. A second post from a different student shows someone asking if they "want to be like a 'n-word' and hang at prom." The posts were brought to light in an editorial in the school newspaper, prompting the school to take action days after prom. In a letter to parents, the principal calls the posts "racially offensive and contrary to the values of inclusion and belonging that are integral to the school culture at Los Gatos High School." The letter added that the school will conduct equity training for students and staff starting in the fall. The school sent the student to see a counselor for one session. It was not clear whether he would face further discipline, but he did express remorse. "I just want to say I'm sorry if I offended anyone. That wasn't my intention," he said. "I'm not a racist kid, and I just want to say this is a big misunderstanding."